***4.5***I loved this story. Even Owen was great. Actually, he was awesome here. The cases are connected, but you get that right in the beginning. The problem they are facing here is more than serious and it keeps you on the edge of your seat until the very end. There are a few moments when you think they've beaten it only to realize the fight isn't over. It was exhausting in a good way. Jack's role is more pronounced, Toshiko got a moment to shine and, as I said, Owen wasn't his usual whinny self-absorbed self.Another thing I loved is the humour. There is lots of it in Something in the Water and it is a Torchwood kind of humour. I'll just select a few examples in spoiler tags. They aren't really spoilers, but still. (view spoiler)[‘We’d both be dead by now if there were. Well, you would be.’Owen looked at him. ‘You’re an inspirational leader, Jack. Have I ever told you that?’---‘Gwen and Toshiko have made it through alive.’‘Alive?’‘It was a close thing, apparently. They nearly died of boredom.’Owen's dark humour:'Two autopsies in one day. Business is good.' ---‘Y’know, I kind of prefer it when the dead stay dead.’‘Pot. Kettle. Black,’ Owen said.‘Yeah,’ agreed Jack with a shrug. ‘The difference is, I do it with style.’ (hide spoiler)]Now for annoying parts or why do they give Gwen a weapon part. Gwen manages to drop her gun every single time something or someone attacks them. Or they take it from her. This goes for the previous three books I've read too. Her presence has way more sense on TV than here. I see her as a necessity of having another fighter (not that she is that good at it) since Owen is a doctor, Toshiko is a genius and Ianto keeps them all sane. And Jack is, well, unique. Loved the storyline, it kept me very gripped. I had a hard time reading this book. It was good, but it was also TERRIFYING to me. I don't do well with outbreak/epidemic stories that involve certain death. And that was definitely the entire plot of this story. So, yeah, terrifying. People are getting sick. There is a water hag causing it. And icky, disgusting mucus creatures are emerging from the backs of people's throats, killing them in an explosion of blood and ick in the process. Yeah. Terrifying. I did like reading about a completely clueless and compromised Torchwood team still somehow managing to go on and do their jobs, knowing they were the only people who could stop what was happening. And I loved that Owen had a lot of theories and thoughts, but it was ultimately Tosh who figured out the key things. But it really did take all of them, nearly dead at the time, to take the water hag down. I was SO RELIEVED when she was finally offed. The finale was tense and exciting but also, and maybe I mentioned this earlier: terrifying! First in the trio of books released for the start of the second tv series. There are a couple of internal references to tell you that it's set between "To the last man" and "Meat", but there's nothing that requires specific knowledge of the show other than the basics of who Torchwood are and what they do. [return][return]Baxendale takes an old British legend and puts a Torchwood spin on it, as a water hag causes havoc around Cardiff. The book starts with several different strands which have no connection other than stagnant water, and for good measure tosses in a flu epidemic that isn't. It takes the Torchwood team some time to connect all the clues, by which time they're infected as well. Much running around chasing or being chased by bad guys ensues, making for a plot that offers both thoughtful research by the team and physical mayhem before they manage to close down a major threat. [return][return]Excellent characterisation, and I could hear the voices while reading much of the dialogue, as Baxendale catches the distinctive speech patterns well. There's a decent spread of word count across the characters, and good ensemble play between various combinations rather than focusing on only one or two (though don't go looking for any overt reference to the relationship between Jack and Ianto, because it isn't there). Owen gets a fair bit of attention, as this is partly a medical mystery and his expertise is directly relevant to one strand of the story. Owen's very likeable in doctor mode, without entirely losing his nasty edge with his teammates, which is the way I like him. [return][return]There's a lot of good banter, and some nice one-liners, not just for the main characters but for the one-offs created for this story. [return][return]It's a solid story that makes good use of both the inspiring myth and various quirks of the Torchwood universe. This isn't just a generic science fantasy with the right names pasted in, but something that's very clearly Torchwood. There are some minor disappointments (in particular, I felt the ending was rather abrupt), but overall I thoroughly enjoyed this one. I can see why people with different tastes might have found it a bit flat, but it happens to hit my buttons rather well. Baxendale's Torchwood books and I don't seem to agree much. The Undertaker's Gift was uninspiring and focused too much on how perfect and precious Gwen is. Something in the Water suffers from its own set of problems, but as far as reading material is concerned, it's still average. I can't even recommend it on its merits as a Torchwood book.Something in the Water starts with three different mysteries that of course end up to all be related. A strange disease with flu-like symptoms, a corpse face-down in the water that turns out to still be able to talk, and an eviscerated Weevil are all the byproduct of the same grand scheme to take over the world. The gore and action sequences were drawn out and over the top, especially the final battle towards the end that takes up forty pages out of 249.There are a few things that keep this book from sinking to the bottom of the Torchwood pile. (I would definitely recommend this one before The Undertaker's Gift.) For one thing, we actually get to see the doctor side of Owen. Even in the show, it's sometimes easy to forget that is his background. Even more importantly, however, is that Ianto actually does things. Like, Torchwood things instead of just serving everyone coffee and cleaning things up, although he does those things as well. It's like people have a tendency to forget that he actually is a member of Torchwood and not just there to do housekeeping or something.Something in the Water falls somewhere in the middle of the Torchwood books, but make sure you can stomach the extra amounts of gore. I have been going through serious withdrawal from Torchwood (the best Sci Fi show ever) and I had been seeing these books around but had not picked one up before. Well the absence of Captain Jack and crew became too much for me the other day so I had to go buy one of the books. This isn't the first book in the series but it was the first one they had available, so into my hands, out the door, and into my house it came.I was not disappointed by the story, it felt like I was watching a really good episode of the show and it was nice to see Tosh, Owen, and Ianto again. Those three characters are highly missed by me and I wish they could be brought back to life on the show.So anyway back to the story the basic concept is you take the legend of Jenny Greenteeth, make her the last survivor of an alien race, strand her on Earth, and make her bent on taking control by creating homunculuses of herself. She uses a bacteria that infect human males and uses their bodies as incubators to grow the little tots. Now I know this sounds cheesy as hell and it sort of is, but it's done in a way that only Torchwood can do. Nothing was lacking in this book the humor I expect, the danger and action that compels the storyline, and the oh so wonderful Captain Jack. Captain Jack makes Torchwood for me and he doesn't let me done in this book. I can't wait for my next trip to the store so I can buy the next book in the series. Every time I read a Torchwood novel I am forcefully reminded, again, that Torchwood doe snot belong in the Doctor Who universe. This universe that so definitely lacks hope doesn't have any business being near the Doctor Who Universe, which is steeped in Hope (with the capital H) -- that said, however, I do enjoy reading the Torchwood novels, as I did enjoy the television shows.In this one, a vile alien creature has haunted the world for some years, biding its time and growing in strength as it prepares for invasion -- previous manifestations written into the history of the world as myth and superstition. It's up to Jack and his canny crew to stop them before they can take over the whole world through Cardiff!It's a good romp -- I enjoyed it thoroughly; Baxendale is writing the "Captain Jack" that Russell T Davis took over, and not the happy-go-lucky fellow Moffatt created, but that's all right. He does a bang-up job of capturing Owen, one of my favorite Torchwood characters (funny how I came to like the "unlikeable" Torchwood characters best...).Our heroes win out, of course; and there's plenty of blood and gore along the way. Doctor Who-niverse? Not so much. But Torchwood? Oh, yes. I found this book to be fun and entertaining, a quick read and not at all challenging, which was what I was looking for when I picked it up. Not much attention is given to developing the "Torchwood" characters, but the book's original characters were better written and more likable than I often find to be the case in TV show novelisations. Baxendale avoids making much reference to the relationship between Jack and Ianto, and in fact Ianto only makes a few comparatively brief appearances, which was a bit disappointing (although I freely admit that I am heavily biased in this case - Ianto is by far my favourite character in the series). On the other hand, Baxendale does write some very interesting scenes between Gwen and Tosh in the first few chapters, which I liked because he took the time to explore their relationship in a bit more detail than in the TV episodes or other novels. As the cover suggests, it's Owen who heads the team in this novel, and he gets to show off his medical skills to the full here as he plays a major role in solving the case. To summarise: "Something in the Water" was like one of the fast-paced, plot- rather than character-driven episodes of the TV show. Not overly memorable but enjoyable if you're a "Torchwood" fan. 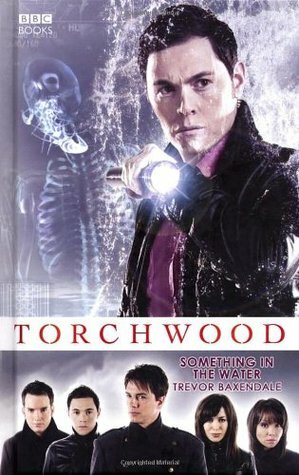 Another brilliant Torchwood story in which the main characters cheat death and managed to save a wide spread alien invasion that was killing off humans at the same time.The alien in this book is a female creature who, although able to taken human form, is basically made up of mud and weed. She has been using humans to incubate her eggs/foetuses until they are big enough to survive on their own. These babies are lodged in the mucus at the back of a person’s throat causing increasing worsening coughs until they ‘hatch’ by basically forcing themselves out of the person’s mouth and ripping them open. Each of the Torchwood team is infected with these aliens, as it spreads across Wales and into England, but it turns out that only the males can successfully bring the alien to full term.Some of the best moments were when Tosh sinks into the moor and when the dead body comes back to life on Owen’s autopsy table.Very well written, in keeping with the TV show, and plenty of plot twists, this book receives 4 stars. I liked this Torchwood adventure book. I really do appreciate that the tie-in novels for TW generally feel more like actual episodes than the DW tie-ins. This one I feel gives a good amount of time to each character and their development, despite it being technically an "Owen" story. I really liked Owen in this book, actually, which is saying a lot considering he and Gwen are tied for being my least favorite Torchwood character. I like seeing him BE a doctor who are cares about people and someone with depth. The story itself is interesting, though it feels incomplete in terms of not actually telling us what happened to all the infected people at the end (if you read the book, you'll see why this is rather a glaring omission). I always enjoy seeing Torchwood having to interact with the local PD and this book has a few scenes of that. There's also a strong thread of Tosh being awesome, which is always appreciated. And Tosh/Gwen friendship, which I think the show did poorly, so I appreciate here. Huh. This was surprisingly good. It lacked the character moments present in Twilight Streets and S2 in general, but was a very well plotted sci-fi medical thriller. It was clearly set between episodes 3 and 4 (one very brief mention of Tommy, but Rhys is clueless), but felt like S1. I don't think this guy read scripts - Owen and Ianto, in particular, felt very last season. Ianto had some snark, and did indirectly help with the case, but spent the entire novel in the Hub cleaning and making tea and coffee. The author even referred to him as the butler in narration, but that's not where he is this season. I also think the author had a bit of a Jack/Gwen bent at times (although there was one or two lines that were Jack/Ianto, and those who know me know which one I loved *g*). But still...the characters were recognizable, if not totally accurate, and it was a really fascinating plot. I'd give it 4.5 stars if I could. The fourth Torchwood book is more focused than the previous three books. For better or worse, there are no personal story lines going on here, and no multiple adventures even though it may seem that there are other things going on.On one hand, the story kind of reminds me of something like "Outbreak". There appears to be a virulent form of the flu going around. On the other hand there is this real horror element involving what might be a bog haunting ghost. I think this would have made a good episode for the series, though it does get very violent and very gory at times.I went back and forth between giving this 3 or 4 stars. I do think, that so far, this has been my favorite book in the series. Though, as good as it is, these books have yet to really impress me. I'd like to give it 3-1/2 stars. I think this is one of the better Torchwood books. It captures the feel of the show and the characters very well, and features humor, action, and the grim despertaion that the Torchwood team wages their battles with.This novel focuses on Jack, of course, and Owen Harper. Owen doesn't get a lot of focus much of the time, and they explore his character well here.The team is investigating a lot of odd occurances which naturally end up being related. They also end up finding the basis for the Jenny Greenteeth legend, which is terrifying. I miss Torchwood, and this book does a good job adapting the sense of the show to the written word. Recommended to fans of Torchwood and science fiction. Several of my friends regularly watch/watched Dr Who and Torchwood. I managed to never get into Torchwood when it was on the air. I was familiar with the characters and concepts due to catching bits and pieces of the show or hearing friends discuss some point or other. I'm more of a reader than TV watcher, so I started reading this series as I was interested enough to see what it was all about. At first, I had assumed the novels would just retell the events from the TV show, but these are totally different stories. The books do occasionally touch on stuff that happened in the show as the events they portray sort of happen between episodes. After reading the first 12 novels in this series, I actually went back and watched the whole show, too, since I liked the characters so much. The storyline was an interesting mix of the mythos and alien intervention which I found fascinating. While there was nothing inherently bad about the book, I found the way that this author in particular wrote the characters didn't quite feel right with me.Which that of course is the problem with having lots of authors writing one set of characters from something. Still it was fun, good mix of twists and such.If you're looking for something full of sappy romance, I wouldn't recommend reading this book. But if you just want something fun to spend some time on it's a good one. Adventure, chasing things around, near death experiences only to get saved at the last minute. And of course Captain Jack Harkness. I'll be the first to admit that I was skeptical when picking this book up. I'm a fan of the show, and books based off television seldom end up worth reading, let alone purchasing. But, with that said, I was quite pleasantly surprised. Something in the Water was a quick read that was wonderfully simple. It read like an episode would, really, and it was beautiful in the sense that it was centered around Owen and Jack (each character had their own moments, though). All in all, it's a must-read for fans of the series, and I'll probably be picking up more in the series. http://nwhyte.livejournal.com/1751423...One of the first run of Torchwood novels, which I am just now getting into (just in time for Miracle Day). A fairly standard monster-of-the-week story, the monster in this case being an alien which poses as a lake creature and infects male humans with its offspring. I felt the writing style was a bit clunky at first but it seemed to get tightened up as we went on. The front cover and spine feature Burn Gorman as Owen, and he does get more exposure than the other four, but we get a fair bit of Jack and Toshiko as well. Will be looking out for more of these. Rereading because Burn Gorman is a glorious human and signed my copy for me and I died a little inside <3Still one of the best books in the Torchwood series. Originally read from February 13 to 15, 2014Damn good story. Good ideas well executed with some pretty good dialogue. Not too gory, but far away from tame. I like that the five Torchwood members all had relatively equally important parts, and that there really was very little squishy and disgusting heart warming moments. They can kill a story faster than Saskia Harden. I'm glad BBC Books has released some supplemental stories about Torchwood characters... but I can't say as I enjoyed this one overmuch. It fits with genre and content-- they even have A plot and B plot, which intersect... but I'd never survive this storyline ever being made into an episode (ever), and the visuals weren't fun, they were unpleasant, with people puking their guts out every other page. I'd call his a "horror" genre book before I called it "science fiction" or "fantasy." Horror's not my thing, but others might like it more than I did. A book based on the BBC television series. Once again, the Torchwood team investigates an incident with the Rift. I thought the author did a good job with the characters. I had no problem picturing each one. The story had a nice pace and fit nicely with the Torchwood world. The ending was a little too nice and tidy for my taste. If you are a fan of the show, this is worth the read. This should be avoided if you have never seen the show and do yourself a favor and go out and watch it. I always wondered if it is harder or easier for an author to write novelizations like these. They are handed fully developed characters and must create the story around them. Does that limit the creative process or does it open entirely new avenues? In any event, Baxendale handles it well with this adventure for the Torchwood crew facing an inhuman swamp hag. I really enjoyed this story. There was plenty of excitement and anxiety. To start with it presented several plot leads - a flu epidemic, a Weevil killer, a serial suicide and a re-animated corpse found in a marsh - which drew all the team into their own investigations. It was only when they all pulled together that they could see the real pattern. I'm afraid I found this rather disappointing. By-the-numbers creepiness, and an overwhelming sense of ordinary, same-old/same-old storytelling. An exercise in competence, and nothing more. A novel like this, coming from the author of "Prisoner of the Daleks" and "Fear of the Dark", makes this doubly disappointing. Like Mr. Baxendale's previous "Wishing Well", this novel is simply...there. This was a decent portrayal of the Torchwood gang. I rather liked the story up until the last 50 pages or so when the battles against the villain became physical, drawn out and rather ridiculous... culminating in a "that's it?" conclusion. I'd have rated the book a whole star higher but for the way the final 50 pages played out. Epidemics, sea hags, murder, mayhem, this book has it all! I believe this story would've been great as an episode. This book is fast paced and keeps the reader's attention. Probably the best "Torchwood" book so far. Once I got started, I couldn't put this one down! The plot was pacy, exciting and really original. The team were all brilliantly in-character; the humour was all there and the story line was really well thought out.This is in my top three of the Torchwood novels. Trevor Baxendale - Trevor Baxendale is a novelist who has penned several Doctor Who tie-in novels and audio dramas. He lives in Liverpool, England with his wife and two children.